We're dead serious. Skullz creates lifelong careers for its hair professionals. Every stylist is compensated based on appointment demand and professional development. As a result, our prices reflect our worth and do not require additional compensation. Your tips are better spent on yourself. So go to lunch or grab a coffee. Afterall, your hair looks great! HIGHLAND SQUARE STYLISTS & APPRENTICES NEEDED: APPLY NOW! Skullz Salon opened its doors in July of 2007 as a labor of love for Angelique. She slowly assembled a small group of the best hairdressers around. They are all still here! All committed to offering "The Best Head of Your Life"! 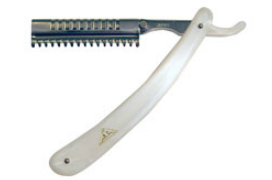 The salon prides itself on resurrecting the art of dry razor haircutting and salon education. This makes Skullz an ideal salon for budding new talent to develop their skills. In 2011, Skullz Salon expanded to include a separate training salon: The House of Skullz. Monthly courses are required of all Skullz Salon stylists, and open to area professionals. Each stylist behind the chair at Skullz has completed our 12 signature module apprenticeship program after receiving their state license. This ensures that every client experiences the service and knowledge of a Stylist that is an expert in the field on modern hairdressing: Razorcuts, Color Theory and Application, Finish Styling for all genders and ages! We pride ourselves in consistency and continue to educate our staff on a monthly basis. This is all why Skullz is not only unique, but the best.